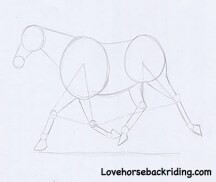 A horse line drawing is one of the simplest ways to try your hand at capturing your equine friend on paper. It involves no traditional shading, everything is done by using lines. This makes it great for beginners to try. 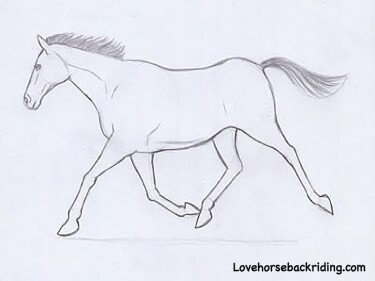 In this tutorial you will be guided step by step in how to line draw a running horse like this one. Before you get started, you’ll need a few things. A pencil with a sharp point. The sharp point will make the lines smoother. If you have drawing pencils you can try an hb type. Drawing paper does have a specific front and back. The more textured side is the front. That is the side you will draw on. If you don’t have drawing paper, any fine textured paper will do. It is also helpful to anchor your paper by using a clipboard or masking tape. That way it won’t move around as you try and work with it. A rubber rectangular eraser, or a putty eraser is a great way to fix mistakes. 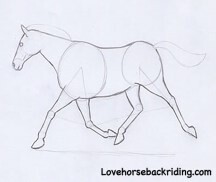 1.First you will create the basic shape of the horse body by using geometric shapes and some lines. 2. Next you will add the line that will become the outline of the body. 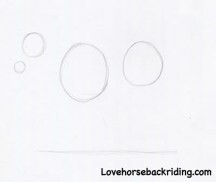 For more fun instructions on how to do different types of drawings, click below.